Did you know that a horseʼs nose is as sensitive as a dogʼs? 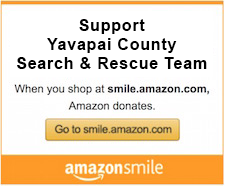 The Yavapai County Sheriffʼs Department Mounted Unit is a trained group of volunteers. wide variety of search scenarios. Several members have undergone additional training such as medical, communications, and search management training. What are the advantages of using horses for search and rescue work? Horses are able to travel faster and farther than their human counterparts. Horses give the rider a higher viewing platform to search from. Horses can transport needed equipment to assist other search units. Horses are very aware of their surroundings and alert the rider to anything out of the ordinary. The YCSRT Mounted Unit is a non profit organization made up of skilled equestrians whose mission is to serve Yavapai County by supporting regional and state professionals in emergency response.